Japan is the conceptual epicentre of shrink philosophy. Our ongoing series of Japanese Miniatures collects and connects these stories and hopefully eventually will be able to inspire some of the fundamental Japanese sensitivity and desire towards smallness in the rest of the world. Akakomugi, an old dwarf variety of wheat, is yet another perfect illustration of what such openness towards the small could bring. Over the last 100 years wheat breeders around the world have worked on increasing the yield of wheat by reducing plant height and making the plants resistant to the below par conditions of intensive agriculture. For this reason, breeders selected plants with short and stiff straw, based on their phenotypic expression, from natural populations or from generations that had been crossed with dwarf varieties. Tracing back the wheat pedigrees showed that most of the dwarfed European wheat varieties have the Japanese variety Akakomugi in their genetic background. 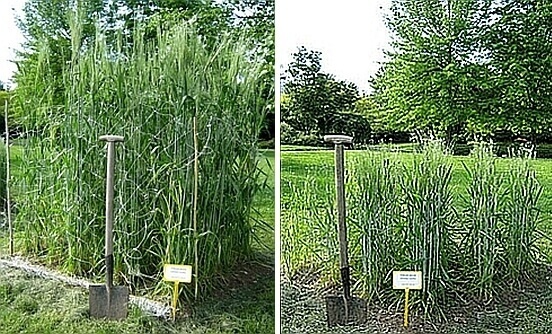 Akakomugi is the donor of a ‘‘reduced height gene’’ (Rht8) which reduces plant height while increasing spikelet fertility and bringing flowering forward. It was the Italian plant breeder Nazareno Strampelli, who was in charge of Mussolini’s ‘Wheat Battle‘ that crossed the Japanese varieties with European varieties in his quest to increase yield. His work eventually contributed to the three-fold increase of wheat production in Italy and many countries around the globe. It’s an example of the possibility to shrink towards abundance. Katrina Borojevic, author of an historical reconstruction of Akakomugi’s introduction into European wheat varieties, notes that short varieties are often introduced under government pressure for larger yields. She writes: “This emerging pattern of seed exchange among breeders and governments’ impact on growing these wheat varieties should be investigated further, to explore the underlying socio-historical influences that may have played a role in determining the pathways of these genes”.